AIR INTAKE HOSE – This air intake hose some times known as an intake duct, intake boot, or intake tube is located between the air intake box and the throttle body on your Nissan Sentra 2.0L The factory hose on Nissan Sentra overtime can develop cracks and holes which can result in a check engine light (CEL), poor fuel economy, and hesitation during acceleration. Replace your broken air intake hose on your Nissan Sentra and restore drive-ability and fuel economy. 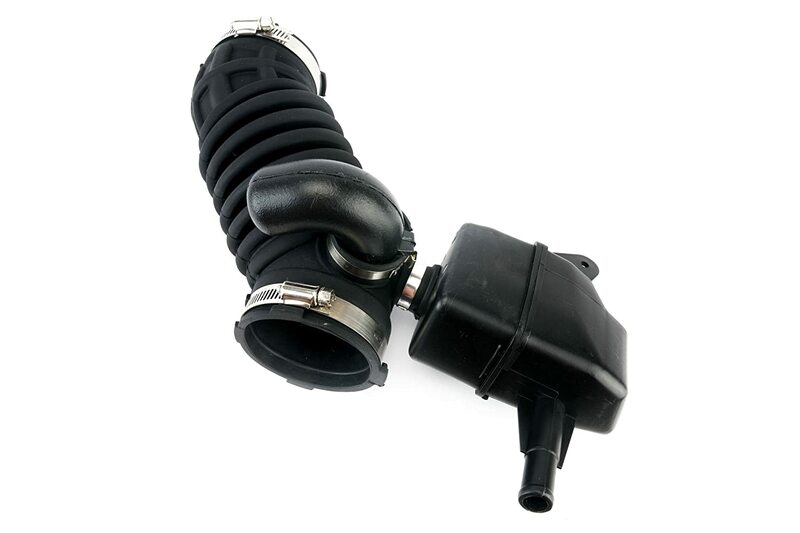 FITS THE FOLLOWING VEHICLES – This air intake hose is a direct replacement for the factory air intake hose on Nissan Sentra 2.0L 2007, 2008, 2009, 2010, 2011, 2012 model years. OEM, FIT, QUALITY, FINISH – This air intake hose is constructed of a high temperature rubber that will not break down and crack like the factory hose. While this is NOT a genuine Nissan part, this air intake hose is modeled after the factory Nissan hose for an exact fit on your Nissan Sentra. 2 YEAR WARRANTY – This air intake hose for your Nissan Sentra comes complete with a 2 year warranty. If the intake hose cracks, chips, or breaks in anyway simply contact us for a free replacement. The air intake hose connects your Nissan Sentra’s air box to the throttle body allowing air to enter your engine. Overtime the factory air intake hose can crack or develop holes resulting in a check engine light (CEL), poor fuel economy, and hesitation during acceleration. This replacement air intake hose by AA Ignition is a direct replacement for your factory air intake hose. Simply remove the factory air intake hose on your Nissan Sentra and install this hose in its place. The installation is simply and can be completed in about 10 minutes. This part is not a genuine Nissan part, it is manufactured by AA Ignition and comes with a 2 year warranty. The term Nissan, Sentra, and associated part numbers are used only to identify the vehicles this air intake hose fits.